You’re getting ready for IPO, and your website is in desperate need of a refresh (like – desperate). Quotes are piling into your inbox from website developers, agencies and contractors, but they’re steep. Not yet ready to write a cheque that would absorb nearly half of your marketing budget, you need a solution for your IR website – and you need it fast. The story above is exactly why we started Piknic. We heard it time and time again from companies that we were so excited to partner with. They needed an impressive website with half the budget and within half the time of a custom build. To others, it might have seemed impossible – to us, we knew this meant that we needed to develop a solution for companies just like this. Can you relate? If so, your next IR website could be built with Piknic – here’s why. We make selecting a website easy. Designing mockups of your perfect website takes a lot of time, with many variations often needed. We know you want it perfect (and our designers wouldn’t expect anything less). Yet, what makes Piknic different is that this hard work is already done for you. Our teams are always working on award winning designs that you can choose from. We’ll present to you a number of design options to choose from. No guessing, going back to the drawing board, or wondering what will work for your company. It’s all ready for you. Our project process is simple. Why make building a website confusing? When you’ve decided to partner with Piknic, we’ll take you through a very simple project process. Our team will outline exactly what we need to get started – your website’s site map, branding files, like your logo, images and fonts, and page copy for your site. From the time we meet to the time our content phase is complete will be around 2-3 weeks. We’ll keep you updated at every stage. As soon as we receive your site copy and branding, we’ll start mocking up your website. We’ll put together your home page and ask for your feedback to incorporate within design edits. Our designs are built with your investors in mind, with a focus on website engagement to mobile-friendly integration from the very beginning. We never skip a step. Our team is focused on high quality, award winning websites for you- which is why we never skip a step. After you’ve approved the final website design, about 30 days into our work together, we’ll develop your website and truly bring it to life. We’ll go through quality assurance testing, make edits dependent on your feedback and integrate your service packages, newsletter feeds and introduce you to optimizing your website for search traffic. . Your website is live and your team is thrilled. You’re ready for IPO! Now what? At Blender, we know that our work doesn’t end when we flip the switch. That’s why we’re here for you even after your site is live. We offer website hosting, a completely customized CMS, Google analytics and reporting, newsletter list management and more. Did we mention it’s a fraction of the cost? Our designers love creating new designs (you should see how many are circulated around the office each and every week) and we only choose the best of the best to offer our clients. Because we’ve completed the intricate design work before we partner with new clients, it makes the timeline and heavy lifting much easier. If you’re looking for an affordable, effective solution for your IR website, you’ve come to the right place. We love talking about Piknic, and we can’t wait to share our new designs with you. We’ve built 90 websites and counting with Piknic, and we’re excited about the year ahead as we unveil brand new website designs. To get started on your own Piknic site, click here. We’ve heard it all before, believe us. As soon as your company reaches the day of IPO, you need to hit the ground running with an IR-focused strategy, with your website being a primary focus. After all, your website is truly your 24/7 representation of your business. That’s why we have put together the 7 things that you need to do in order to get your website ready for IPO. 1. Include messaging about your competitive advantage. With a fresh new face on the scene, you need to differentiate yourself from your competition. What’s your competitive advantage? What makes you different, or better to invest with than your competition? Why should investors contact you? 2. Speaking of contact, don’t forget those contact forms. Each and every page on your website – especially your investor relations page – should have a contact form or CTA to contact your business. Every single page on your website serves a purpose, whether informing the reader or attracting the investor. Make sure he or she can contact you, and that your information to contact is clear. 3. Highlight your projected growth. Investors want to know what the future of your business is, or the very least, what they can expect from your project growth timeline. Highlight areas of opportunity, growth, quarterly projections and more. It’s important to show a track record of execution, such as milestones that the management team is capable of executing, then following up with future milestones as projects progress. 4. Internally, make sure you have a point of contact for website updates and changes. If no one owns a project, it won’t be completed – that’s the case for any organization or project, regardless of the scope. Assign the IR website to an individual or department within your organization. Whether it’s someone who has a very keen interest or perhaps a natural fit, such as your Marketing department. Google Analytics measures your website data to gain insights, such as where your visitors are spending the most time on your site, or where your website visitors are coming from. Without Google Analytics, you won’t be aware of user patterns or potential changes to make to your IR site. Install Google Analytics before your website goes live. How will your prospective investors stay connected with you? Through your email newsletter, of course! Encourage sign-ups of potential investors through regular email correspondence. Some companies send weekly newsletters, while others will offer updates through email only when press releases are sent, or major company events are released. This can act as a targeted investor database, something that is invaluable for your business. We’re always happy to talk CASL. Contact us if you have any questions! 7. Ensure your site is mobile friendly. We are well past the tipping point of mobile usage exceeding that of desktop usage. Mobile usage exceeded that of desktop usage a few years ago, though a large percentage of companies have yet to catch-up. Before you launch your website, ensure it is mobile friendly – that is, you can browse freely on your smartphone device without having interruptions in functionality. Getting your website ready for IPO is only one of the many tasks you need to complete before you go public, yet it can be one of the most important in creating awareness of your business and turning prospects into investors. With 2018 upon us companies are coming to us with plenty of questions – “Blender, what’s in store for next year? What are the 2018 website trends that I need to know about now? How can I get my website ready for the year ahead?” – so if these questions have been percolating in your mind as you prepare for 2018, you’ve landed at the right place. Last year we shared our digital trends and predictions for 2017, packed with tips like the importance of video, mobile marketing, social integration and more. This year, it’s all about website design – and what you can do to get your website ready for the year ahead. With this in mind, here are the top 2018 website trends you need to watch for. 1. Investment Highlights pages are more important that ever. Every website has a purpose. While some are meant to attract customers, others – like yours – are meant to tell investors who you are and what you’ve accomplished. Your website should include investment highlights and initiatives should clearly outline who your company is and how you create change within your industry. Investors – especially millennial investors – are becoming increasingly focused on transparency. Transparency from companies just like yours. White Gold Corp has done a tremendous job in sharing their exploration highlights on a dedicated page here, while Uranium Energy specifically tells investors why they should invest in UEC on their highlights page. 2. Bold fonts, engaging colours. We’ve seen plenty of changes and trends within design over the years, yet one thing has truly stuck – the focus on clean lines and modern designs. With this comes the complement of bold fonts and engaging colours, ones that encourage users to focus on your content. In 2018, we expect to see such fonts and colours take the place of some images on websites. This is because images tend to slow pages down, especially when viewing on mobile or tablet devices. Typography, on the other hand, doesn’t impact performance. Faster sites, happier web visitors. Easy as pie. We’ve talked at length about the need to integrate mobile into your website strategy and build, though 2018 is all about mobile – meaning, mobile first. The truth is in the data. Google says that 61% of users will not return to a mobile site that they had difficulty accessing, while 40% of these users will visit a competitor’s site instead. This should be a shock for those in the IR space. If your target investors don’t love your website, or if it’s not mobile friendly, they won’t come back – and they’ll end up in the hands of a competitor. 4. Video is integrated everywhere. Website development is certainly moving in a direction that focuses on video; in fact, video accounts for nearly 70% of all internet traffic. When it comes to web design and integration of video, this form of content is increasingly being used everywhere, from corporate pages to investment pages, and CSR sites in between. Does your business have a video strategy in 2018? 5. SEO has become a necessity. Online experiences start with a search engine. In fact, 93% of all online experiences begin with a prospect or potential investor heading to Google and typing in keywords that are related to your business. If your website isn’t optimized for search, you’re missing on a plethora of traffic opportunities that are available to you. In 2018, websites will be optimized – we’re talking meta tags, meta descriptions, meta titles. With 61% of people performing an online search before deciding to partner with a business or make a purchase, this is more important than ever. These 2018 website trends are the focus for those of us in the IR space as we prepare for the year ahead. From CSR to bold fonts, mobile-focused to video, we are preparing each and every one of our clients for a brand new year. From all of us at Blender Media, Happy New Year! When it comes to resolutions for the New Year, we all have various personal and professional goals that we are seeking to accomplish. Whether it’s a personal goal that will work to make you a stronger leader in your workplace or community, or a professional goal, like creating and launching an optimized online IR strategy for your company, this is time of the year when we are ready to get started on our New Year Resolutions. And if IR Resolutions are what you’re making, this blog is for you. We’re excited about what is to come in IR for 2017. So excited, in fact, that we’ve compiled the IR resolutions that you need to know about now for this New Year. With a compilation of trends and insights we’re ready to see unfold, you’ll want to bookmark this blog and review in the upcoming quarters. Here are the IR Resolutions for 2017 you need to know now. Review and determine if your website needs a refresh. 39% of people will stop engaging with a website if images won’t load or take too long to load, so it’s time to ask yourself – does your website need a refresh? Furthermore, given 15 minutes to consume content, two-thirds of people would rather read something well designed than something plain, and a bore to view. Given the fact that visitors to your website are unlikely to spend 15 minutes on any given page, you have a limited amount of time to make an impression on your IR visitors. In 2017, it’s time to review and determine if your website needs a refresh. 59 percent of executives admit that they would rather watch video than read text, which means that your IR decision makers are looking for video content in the New Year. It should be an integral part of your website’s infrastructure, and can no longer be considered an addition to your IR strategy. Integrate video content on your home page, your company’s about us page, your contact page and more. Ensure it is engaging content – and short! Aim for a video length of 0:30 to one minute in length. Do you need to update your CSR strategy? Although we have seen a great number of companies who have an understanding of how CSR can impact their IR strategy, showcasing your efforts will soon be the norm. CSR has been more of a trend seen in the European and Asia-Pacific regions, but 2017 will be the year that it becomes increasingly relevant in North America. With this in mind, it’s time to review your CSR strategy and online presence in this New Year. Ask yourself – does the CSR section of my website accurately reflect our internal efforts? Use social media to tell your story. Although you very likely have presence online, and perhaps even use Twitter, Facebook, LinkedIn and Instagram every single day, this is the time to review how you are telling your company’s story through social media. 62 percent of adults in the United States get their news on social networks, which is up from 49 percent in 2012. It’s clear that this trend will only continue in 2017. As you are making company announcements or CSR initiates in this New Year, consider how social media can compliment your strategy. From a website refresh to video, CSR to social media, your IR resolutions for 2017 range in topic, but will all play a significant impact on your business within this New Year. Take time this month to review your strategies currently in place, and consider the benefits of making optimizations now. When we first sat down to brainstorm the resource, Connecting With Your On-The-Go Investors, we had one goal in mind: to better educate you – an individual working within investor relations – so that you feel more informed on the mobile landscape, including how being mobile-friendly impacts your SEO rankings and user experience, and how your competition – or other Canadian issuers – are adapting within this new landscape. With the frequency of change in the mobile and web space, it was clear that we needed to be proactive instead of reactive, and issue a resource now that could be used not only throughout this year of 2016, but into 2017 as well. As the resource is online, it’s fluid in nature, meaning that we will be constantly evolving and updating with the latest updates so that you feel more confident within the mobile landscape. As you’ve likely taken a look at a few of our blog overviews (like some of our favourite IR website examples), we wanted to rewind and share with you why we created this resource in collaboration with CIRI. We wanted to educate those working within investor relations. You’re so focused on your day-to-day, so your website is often the least of your concerns. We’re here to tell you that it should be at the top of your list, at least one per week. In America, 64% of adults now own a smartphone of some kind, up from 35% in the spring of 2011. What’s most interesting is that smartphone ownership is especially high among younger Americans. This demographic across America, Canada and other countries will be your target persona in years to come. It’s more important than ever to leverage today’s technologies in order to engage more effectively with the future IR community. We want you to reach your goals for 2017. With the New Year right around the corner, it’s more important than ever to set goals that will impact your business in 2017. If a potential investor or business visits your website and they bounce off before letting it load, for example, this could be because your website isn’t mobile friendly. And bounce rates significantly impact your business. Overall, they will impact your search rankings within Google, which means potentially less visitors to your website, but absolutely less organic, earned traffic and media. We want Canadian companies to succeed. With such a competitive landscape in the marketplace, we want to help Canadian companies within Investor Relations succeed. By providing resources to those within the Canadian Investor Relations industry, we believe we can truly help fuel success for brands and business moving into 2017. If you have yet to read “Connecting With Your On-The-Go Investors”, you can click here now to view. This resource is complimentary, and we encourage you to share with colleagues. We are surrounded by some great peers in the industries we work in, and decided it was time to tap into that valuable source of knowledge. 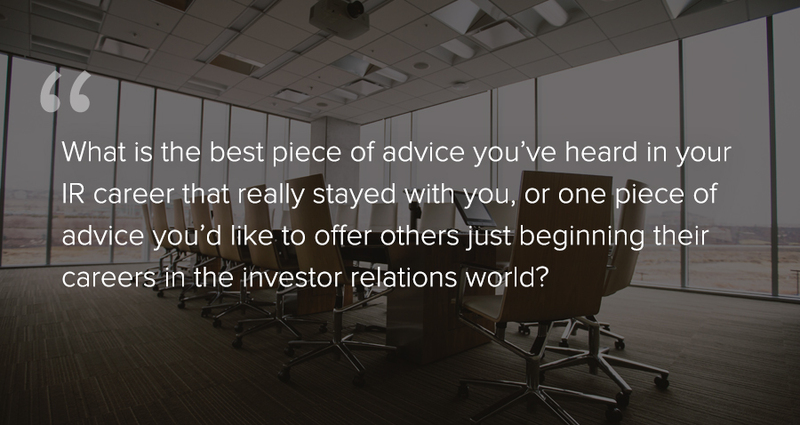 At the end of last year, we interviewed some of our clients as well as other experts in the investor relations industry, and asked them about the most valued piece of career advice they could remember from working in IR. See below for their responses. Thanks so much to everyone who contributed and shared a bit of their smarts. We really appreciate it! You never tell anyone to buy your stock because you won’t tell them when to sell. Your job is to equip the market with the best information available for investors to make their own decision. My advice sounds trite but it has really helped me. It was given to me by my former boss Tony Takazawa, VP IR at EMC. He has minted many an IRO (heads of IR at Seagate, Carbonite, and yours truly). One challenge IRO’s have is that the variety of tasks in any given day is wide, and makes it difficult to feel like you’re getting much traction in any one area. He suggested three simple words which have become a mantra: focus, speed, quality. I’ve even written “FSQ” on the post of my monitor so I can see it all day every day. Keeps me on track. Stacey Pavlova | Investor Relations Manager | Silver Standard Resources Inc.
My advice: Getting close counts. I have a tendency to want everything to be perfect, a trait I share with many IROs. When working on communications, rather than expending energy and time on another iteration of a document that already gets my point across, I move on to another, equally important task. When working on advocacy, I accept that only elements of our position may be adopted by regulators, not our entire position. These communications or advocacy efforts may not be perfect, but they are still successful as my message is being heard, which is ultimately my goal. I have this quote posted on my bulletin board. I’m not sure of the source, but think it is good words to live by. Mélanie Hennessey | VP Corporate Communications | Novagold Resources Inc. Engagement with all stakeholders has been extremely beneficial throughout my career. Each stakeholder represents a piece of a puzzle, from the Board, to management and employees, to the buy-side and sell-side, to the broader markets and local community residents. When it all comes together, it provides you with incredible insights to best understand your business and the value proposition your company has to offer. Moreover, it helps you better understand what role you play in presenting a strong investment thesis to your various stakeholders. Through the years, being flexible and open to change has been critical! James Buskard | President | Nevada Exploration Inc. I think one of the biggest mistakes is only reaching out to your shareholder/supporter base when there is good news, or when you need them to open their cheque books. I once got scolded by a broker that I only called him when I was looking for money. It is important to keep the lines of communication open with your audience at a regular interval. Simply saying hello can be enough to keep investors in your story, which in some markets is just as hard as getting new investors into your story. So, take home, touch based with your core investor group at least quarterly, no matter what is going on. Erin O’Toole | Investor Analyst | Novagold Resources Inc.
Find a way to say “yes” to as many opportunities as possible whether it be sitting on a panel, joining a committee or attending a new industry event. You never know what you might learn, who you might meet, or where it may lead. The what: Google is making some changes to the formula it uses to rank search results on mobile devices. The changes begin to roll out April 21st and will have a “significant impact”. If your website is mobile-friendly, it will be favoured and appear higher on search results than one that’s not. “When it comes to searching on mobile devices, users should get the most relevant and timely results…as more people use mobile devices to access the internet, our algorithms have to adapt to these usage patterns…Starting April 21, we will be expanding our use of mobile-friendliness as a ranking signal. This change will affect mobile searches in all languages worldwide and will have a significant impact in our search results. Consequently, users will find it easier to get relevant, high quality search results that are optimized for their devices”. The also: Remember, back in November Google launched the ‘mobile-friendly’ label in mobile search results to “help mobile searchers know which sites they may click on”. This new April 21st update will take into account your site’s ‘mobile-friendly or not’ label and use it to determine if your website should appear higher in search results. Does Google care how I get mobile-friendly? Google writes that they ‘recognize three different configurations for building mobile sites’. Out of these three types, they recommend using responsive design. Heard that word around and still not quite sure what it means? Never fear. As part 2 of your Mobilegeddon vaccine kit, we’re talking next week all about responsive design vs. mobile-friendly vs. mobile site vs. other delicious jargon. So stay tuned. Why does Mobilegeddon matter to me? Let’s break Mobilegeddon down with some real numbers. Many researchers have said that 50-60% of all Google searches are now done on mobile. So look at that as over half of your target audience (be it potential investors, those in your community, etc). looking at your website on a mobile phone. If your site isn’t mobile-friendly after this update? Well, then you’ll be really hard for people to find. We took a look at some of our numbers and found that 40% of site traffic to our client’s websites comes from either a mobile or tablet device. That’s pretty huge. And it means that after Google’s update goes into effect, these websites could lose that same percentage of traffic. We think author Jay Taylor puts the vitality of optimizing for mobile the best. He says: ‘go mobile or become irrelevant’. The phrase ‘search engine algorithm’ seems important, but makes my head hurt. We thought it might be helpful to give you a basic sketch about what we’re even talking about when we announce that Google is changing its secret search engine formula. Basically, those lucky Page 1 search results are actually anything but luck. The Moz Blog writes “the factors in the algorithm consist of ‘hard factors’ as the number of backlinks to a page and some social recommendations…you may also have factors on the page itself”. Basically, all that hodge-podge means is that there are different, very specific factors that Google uses to decide where your site will rank in search results. Mobilegeddon means that mobile-friendliness just became one of those factors. There are many small things you can do, such as including certain words in your website, to appear higher on Google’s search results. Heard of that snazzy acronym SEO? It stands for Search Engine Optimization, and there are whole books about ways to optimize yourself for Google. We’ve written a bit about SEO and other Google analytics tools here, and we work SEO tactics into our clients’ websites daily. For now, however, we just want you to be aware that the results you see on the first few pages of Google aren’t there by accident. If you’re wondering how to get higher on Google, mobile optimization is what you need to be thinking about. We got you. If any of this stuff still confuses you, this post is part 1 of 3. We’re going to ride out Mobilegeddon until that treacherous day of April 21st. As we mentioned earlier, check back in next Tuesday for a thorough breakdown of what it means to have a site with a ‘responsive design’ (good to know since Google recommends it), what the difference is between responsive design and just having a mobile site, and what in the world people mean anyway when they want you to be ‘mobile-friendly’. In-N-Out founding family, Harry and Esther Snyder, in 1948. One of the secrets of In-N-Out’s success comes in the brand’s dedication to their California “birth story.” The company was founded by Harry and Esther Snyder in 1948, and is widely believed to be the first drive-thru burger shop in the U.S. Since this iconic moment, In-N-Out’s marketing efforts have revolved around the culture and environment surrounding the burger chain’s birth. Bloomberg Businessweek writes that In-N-Out, in “playing up its roots as a drive-through” is “echoing the days when roadside diners attracted travellers with their kitschy neon architecture, stores strategically placed along free-way off-ramps”. In-N-Out Burger makes sure to infuse a back-story into every marketing strategy. Without even realizing it, you’re not just buying a three dollar burger, but 80 years of road-trips and family memories. The AdAge article “What Doesn’t Your Brand Stand For?” notes, “It’s easy to stand for a lot of things, which is where a brand usually makes its biggest mistake. A brand becomes bloated and fuzzy when it tries to stand for too much”. In-N-Out Burger, however, is hailed for its “courage and discipline” in making sacrifices in the name of their brand. “They’ve given up aspects of their business and turned down opportunities that others might have considered vital. But, through their sacrifice, they’ve become [a] worshipped brand”. With a firm grasp on who they are as a company, In-N-Out is able to make calls about what aspects of their brand are crucial to showcase and what others can be saved for another space, or done away with all together. Continuing with their quaint California road-trip feel, In-N-Out elected against rapid expansion, instead seeping ever so slowly into a single state at a time (they only operate in five). It can seem a bit of a contradiction, but representing less in a marketing strategy can actually garner more attention. You don’t want to spread yourself too thin; trying to represent the interests of everyone will only make your company seem scattered. Quality people, quality service, quality product. Sound like your goals? Putting in quality time to perfect your digital marketing strategy is important. Trust us, people remember that stuff. They remember prompt email responses, mobile friendly sites, and eye-catching investor presentations. Every piece of material online with your name on it represents you. Make sure you like what it’s saying. IN-N-Out resides in an overwhelming market; one where competitors have tried everything to make their burger stand out as the best. We’ve seen square patties, cactus burgers, and half-naked women on TV spots munching away in efforts to stand out from the crowd. In-N-Out, knows, however, that they’re not just selling a burger. They’re about the experience, and about trust. There’s a reason that in the 70 years they’ve been operating, In-N-Out has stuck with their simple menu of double-double, cheeseburger, hamburger, and fries (not counting their secret menu with the famous Animal Style burger). They know what they do best, and they know what people like to see. So what do you do better than anyone else? What is the one message you really want to get out with your digital marketing strategies? One strong, amplified message gains a lot more traction than several scattered ones. The “don’t spread yourself too thin” lesson works here too. Figure out what you do better than anyone else and don’t only highlight it. Specialize in it. Lead with it. It’s a tale as old as time. The somewhat forced perkiness of the stewardess in an airline safety video, reminding everyone aboard a departing flight of the necessary safety information. The talk on the video could just as easily be white noise. Instead of listening, we use this time to check last minute emails, send off a quick text or two, and contemplate the in-flight food packages, wondering if we’re willing to spend $35 on a protein and cheese plate But what if that boring, mandated in-flight safety speech was completely rethought and redesigned? Cool story bro, how does this relate to me? We love bringing examples to you of industries that are find new ways to engage with their target market and reimagine the way they communicate with their network of customers and peers. See how United Airlines and Air New Zealand are reinventing the wheel when it comes to reporting about airline safety, and use this as inspiration in your own investor communications. Air New Zealand has always been ahead when it comes to making engaging and unique videos, but they recently became Lord of the Safety Video with this ‘Middle Earthean’ take on in-flight instructions. The safety video also features appearances from famous Lord of the Rings figures, including Elijah Wood and Peter Jackson, as well as a handful of other stars. United Airlines fused airline safety instructions with clever, everyday situations, taking passengers to Paris, Las Vegas, and even inside a yellow NYC cab. And United Airlines turns to origami as a stewardess ‘folds’ paper into a perfect rendering of the current plane before explaining the exit plan. Both these videos remind us of the possibilities in re-imagining old content and presenting it in ways where it is both more engaging and successful with viewers. They also show us that to be creative or inspirational, you don’t always have to come up with new words; approaching the same content a different way can be equally inspiring. This is especially interesting when thinking of public companies sharing their story with investors. How can mandated content be spun a different way? These airlines make sure to include the necessary info, such as the locations of flotation devices and the proper way to secure a life-mask, but give it a completely fresh delivery. Words that have been repeated hundreds of times are suddenly made current again. Even if you’d rather zone out for the minutes before departure, these videos capture your interest and make you pay attention. What is SEO exactly? It stands for “search engine optimization” and it’s meant to improve your website’s performance in search engines… yes, but how? How does it work? And how does that relate back to you? What would your company get out of it? That’s what this post is all about, translating technical jargon into the essentials that you need to know about SEO. SEO is the process of optimizing your website to make it easier for people to find your company through search engines like Google. Even if your company is on the first page and top ranking, check if the overall search result is optimized or not. Is the page title followed up with a concise yet informative phrase that best describes your company? What SEO specialists do is that, they add Meta descriptions as page summaries, which often gets used on search engines like Google. Take a look at what we did with Western Copper’s search engine marketing [image on the left above]. Instead of just saying Western Copper and Gold Corporation, the page title also tells you what the company is (in this case, “Copper and Gold Mining Company”). Underneath the description or page summary, Blender also optimized Western Copper’s exposure by adding links to the inner pages of their website. Of course, there are a lot more to SEO than just looking good in the search results. SEO allows you to optimize your website to its fullest. So imagine all the little tweaks that we can do to improve your exposure online – from helping Google to understand images, site structure, content, URLs… and SEO for mobile as well! Every little detail counts and helps broaden your reach! Give us a call if you’d like to talk to our SEO specialist to know more!